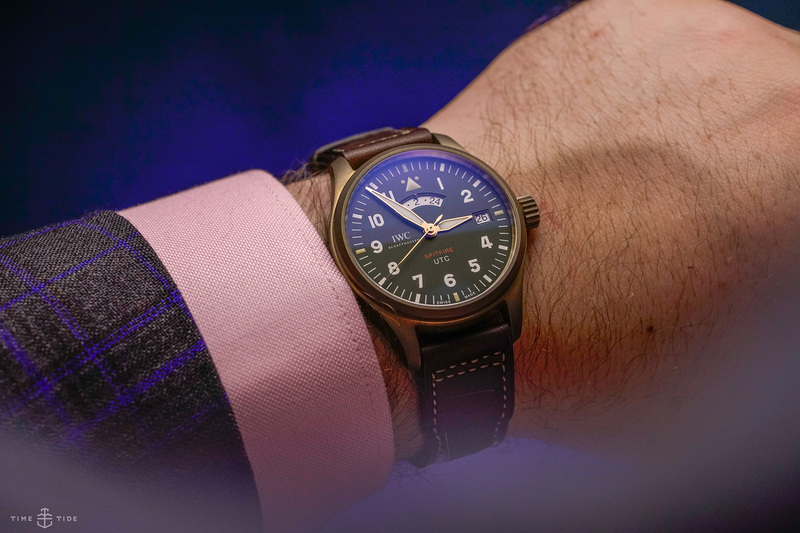 One of my highlights of SIHH every year is IWC – and not just because their booth is exceptional; this year it was dominated by an actual gleaming silver Spitfire. No, I like seeing IWC because the watches rarely disappoint, and this year was absolutely no exception. The Pilot’s collection is one of the brand’s iconic staples, and hugely popular in Australia (and, for that matter, around the world). And at SIHH it got some major new additions, mainly in the Spitfire and Top Gun sub families. Spitfire is the more retro of the two, and covered off the classics — a pitch-perfect 39mm automatic, a chronograph, a simpler Timezoner, a Big Pilot-cased perpetual and even a welcome return of the UTC. Now, while it’s easy to get caught up in the bronze cases and green dials on offer, for me the really big news is that the whole Spitfire family is now powered by in-house movements. Over in the Top Gun line, novel materials were the name of the game — with Ceratanium making an appearance on the Doppelchrono, and a gorgeous khaki ‘Mojave’ limited edition that I just can’t get out of my head. So, time to cue up Kenny Loggins and get ready for some high-flying horology.